Laminate has become increasingly popular in recent years and has long since established itself in our homes. The multi-layered floors bring some advantages. Compared to a real wood floor like parquet or solid wood flooring, there are of course some disadvantages. Above all, the price-performance ratio can score laminate. Laminate flooring is characterized by a multi-layered construction . This consists of a cover layer, a durable decor, a backing plate and a counter-pull together. In some cases, the floorboards are additionally equipped with footfall sound insulation. This guarantees a pleasant room acoustics. Is not integratedImpact sound insulation available, this should be additionally laid under the laminate floor. We have put together the advantages and disadvantages of laminate, so you can decide for yourself whether a laminate floor fits your needs. Laminate is very hard-wearing. It is abrasion and impact resistant, heat and light resistant. The panels have a thickness of six to twelve millimeters. Here is the rule: the thicker, the more robust is laminate . The thickness of the material also depends on the price: Cheap laminate is usually comparatively thin and has a rather simple decor. In addition, cheap laminate is more sensitive to moisture and the natural abrasion, because even with laminate applies: you get what you pay. A higher-quality laminate is correspondingly stronger in comparison to a low-cost laminate and usually has a complex surface design in order to represent the wood grain in a realistic way. In doing so, the wood is modeled not only visually but also haptically - with fine grooves on the surface that reflect the grain and structure of the wood.As a result, the laminate resembles a real parquet floor in appearance and even feels so similar. The laminate surface is painstakingly sealed in this case - therefore, the laminate is also more resilient. With modern printing processes, the manufacturers simulate different structures. Wood decors in oak or beech are just as authentic as the decors of tropical wood species. Textured surfaces not only look real, they also feel real. Stone decors mimic the structures of stone types such as slate or marble. Design decors are exceptional and go well with modern decorating styles. Thanks to the variety of décor, matching laminate floors can be found for different tastes and living spaces. The floorboards have intelligent click systems. This makes them easy to lay floating. You do not need glue for this. With a little manual skill, you can easily do it yourself. In the case of a move, you can dismantle floating laminate and take it with you . The click connections guarantee a joint-free surface. The floor has a low construction height. As a result, you rarely have to cut your doors. Laminate is not only easy to lay. With laminate you have a flooring that does not require much attention. It is easy to care for: It is sufficient if you regularly vacuum the surface and wipe it with a damp cloth if necessary. The surface is very robust, lightfast and scratch-resistant. The floor is also hypoallergenic.High-quality laminate flooring is very difficult to distinguish from a real wooden floor. Nevertheless, he is significantly cheaper to buy. Laminate is the floor covering that convinces in terms of functionality, design variety and robustness. As an alternative to expensive and often cost-intensive parquet flooring, laminate flooring with a well-balanced price-performance ratio is far ahead in the ranking of popular floors. We take a detailed look at the properties and advantages of laminate. We also explain how differences in price and execution can be questioned. Laminate is suitable for use in both private and commercial applications. You can choose between products of different usage classes. The layers of a click laminate floorboard are based on the proven basic principle. -The laminate flooring is sealed on top. Highly compressed wood fibreboard - also known as HDF board - forms the supporting core of a good laminate, whether country house plank or tile-look laminate. Products with MDF as carrier material are also offered. The laminate flooring is seared on top. It is usually a highly abrasion-resistant top layer in the form of a melamine resin overlay. Directly underneath it is the elaborate reproductions of various types of wood, stone optics or unusual designs lend the laminate flooring its individual expression. The variety available here offers a number of design possibilities. The construction is supported by a stable carrier material made of highly compressed wood material (HDF) or, if necessary, MDF. Depending on the quality of the laminate, the support plate is also protected against swelling and suitable for use in humid rooms under certain conditions. The respective click mechanism of the planks or tiles is also anchored in this supporting element. The so-called counter-tension closes the laminate panels downwards. It ensures dimensional stability under load. For many laminate flooring, a footfall sound insulation is already laminated at the factory. Of course there are some points where real wood floors are superior. 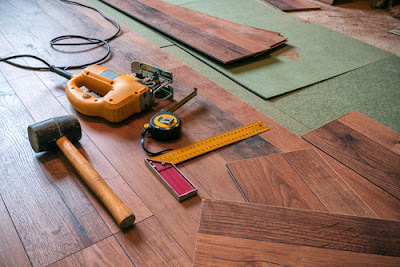 Parquet floors and solid wood flooring are renovatable. This makes them much more durable than a laminate floor. Wood is also a natural product that radiates heat and supports a healthy living environment. Each floorboard is unique because of the individual grain. Laminate boards are equipped with decors that are printed. They are not unique. The decor repeats itself on the floor. In addition, laminate is foot cold and can become electrostatically charged. Some manufacturers provide their products with a special source protection, which protects the floorboards against moisture penetration. Generally, laminate is sensitive to moisture. For wet rooms like the bathroom are Vinyl floors usually better. Floors made of laminate are initially very robust and durable - that which takes place under high pressure and temperature compressing the layers provides. The cover layer also ensures high abrasion resistance . Today, laminate is often sold with a simple click system and is too embarrassing to laymen. Since the look of a laminate is determined solely by its decorative layer, thanks to digital printing virtually any look is conceivable. But most of all, the good old wood look is still bought. With a good surface structure , laminate can look deceptively similar to a real parquet. 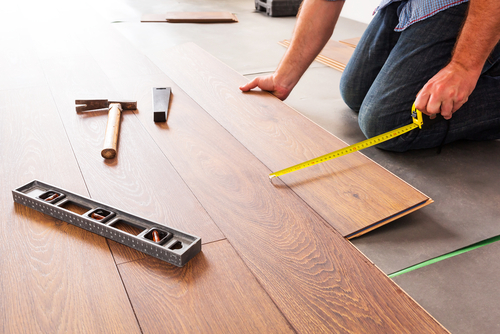 In addition, laminate floors are usually suitable for underfloor heating . A high-quality laminate is even prepared for moisture - our laminate floors, by the way, are all protected from moisture because of their edge impregnation . So they can be wiped wet or simply vacuumed for care. Laminate floors are very resistant, but once a quirk is in it, it can not - as is the case with parquet - simply be sanded off. This would destroy the decorative layer, so that the carrier layer is visible. Is also recommended for laminate a footfall mat, since the material itself have little or no impact noise contained. For some laminates such an insulation is already glued on, so it does not have to be brought forward.